The sea turtle hatchlings are emerging from their beach nest to the big ocean and begin their lives. 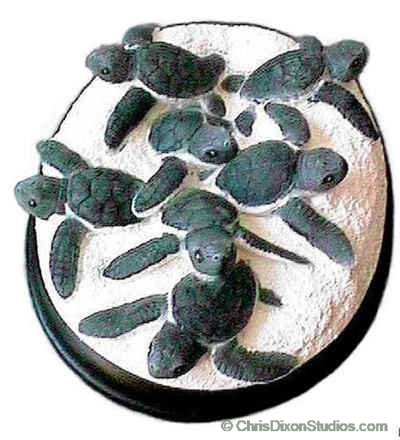 Also available as the pair of sea turtle hatchlings. This life-size nest is a popular and unique wildlife art collectable. Brand new with artist signature, copyright and unique hang on card. These hatching turtles will have to overcome tremendous odds to return as nesting adults. Adults grow as large as 600 pounds averaging 220 - 440 lbs and 35-48 inches,with a life span of 50 years or more. Green sea turtles feed almost exclusively on seaweed (turtle grass) and green algae, occasionally eating mollusks, crustaceans and jellyfish. Sea turtles navigate up to 1,400 miles between nesting beaches and feeding areas. Sea turtles have traveled the open seas for over 100 million years. Beaches worldwide are most important nesting sites for the green sea turtle. They have been overexploited for turtle products and food. Thousands of sea turtles accidentally drown annually in fishing nets; turtle excluder devices (TEDs) are used to help these reptiles. Discarded plastic bags, wrappers and garbage are mistaken for food, blocking their digestive system to death. Lost, non-biodegradable fishing nets and trash are a life-threatening hazard to a variety of sea life for many years. Boat propellers are a problem when sea turtles congregate near the shore during peak nesting times (June-July). Human activity and lights can prevent females from coming ashore to lay eggs; and later confuse hatchlings on their need to quickly reach the ocean. We can all help by reporting turtle activity to local conservation organizations, which provide safe hatcheries, greatly improving the chances of young turtles' survival. Safe boating and continued research on acceptable fishing practices are ways in which we can insure the survival of these ancient travelers of the seas.